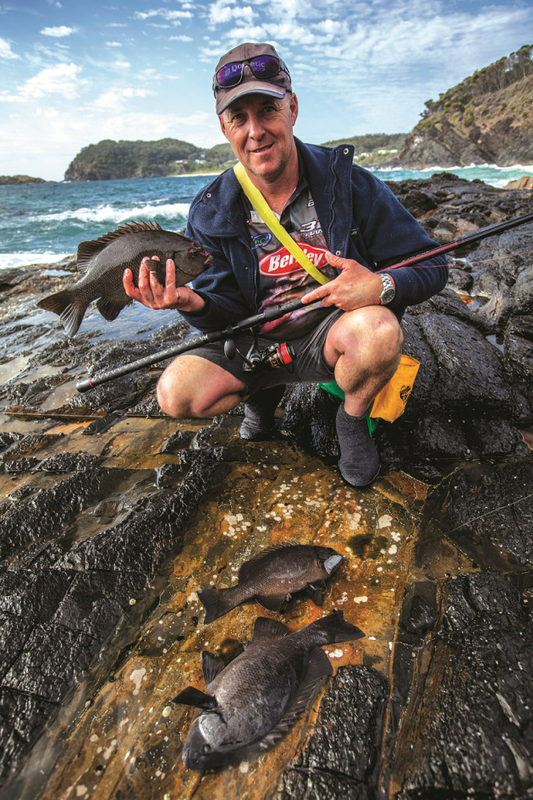 The author reckons rock blackfish are nearlty the complete package when it comes to an angling target. 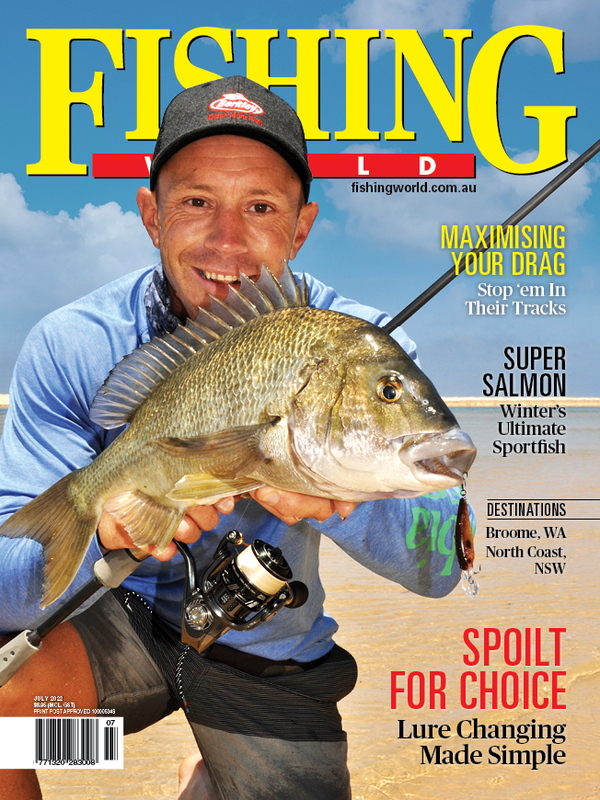 THE fishing industry and anglers have always entertained trends. Whether it's the individual angler making a bucket list or the industry promoting the latest angle, there has always been motivation and direction toward facets that generate a collective interest. Some fads come and go, and some become the foundation in the regular routine of anglers that are a favourite form of fishing. For most anglers the prime objective of fishing is to enjoy some time relaxing and, with some luck, be able to take a feed of fresh fillets home to the family if they wish. I must confess to being an angling tragic when it comes to eastern rock blackfish or pigs, black drummer or just drummer as they're often called. As angling targets, they tick most of the desirable attributes that anglers need to cement a fish in their top five target species. They are a brilliant table fish, they take a wide range of baits, they are triggered by tidal stages and not low light, they fight like the devil and grow to over 6 kg. If only they took lures on a regular basis they would be number one for sure. Pigs are available from the rock washes year-round, in some areas, but are at their very best during the cooler months when they congregate along the shallow coastal fringe to breed. They feed in the intertidal zones and rely on high water to be able to sneak in, with each wave, and harvest weed growth from the rocks. Blackfish fight hard when hooked. Being omnivorous the fish are opportunistic and will eat whatever is easiest to scrounge from the rocky coastline. Traditional baits like cunjevoi, abalone gut, sea cabbage algae and limpets, and their abundance in any area, is a good indicator that you are fishing the right spot. Deep channels between fingers of rocks where the waves flow through, filling the area, are ideal for the fish to congregate and feed. These days with calls for sustainability, resource protection and biological bans has led to a shift in the types of bait many anglers use to supplement and reduces pressure on the natural growth of the intertidal areas. Biosecurity suggests that green prawns, bought from supermarkets and intended for human consumption, can carry White Spot Disease and consequently may infect natural stocks of prawns and crabs if used. Even cooked prawns bought from supermarkets may, with low risk, be cross-contaminated with the virus due to close proximity in the display counter. Boiling prawns (longer than 4min), including cooked prawns, will inactivate the virus and make the prawns safe. It will also toughen up the prawn meat and it will hold better on the hook. Should you prefer green prawns as bait, please source them from a reputable bait supplier, locally self-caught prawns or tackle shops. Never use green prawns (including heads or shells in berley) meant for human consumption, it is a risk we just should not take and are responsible for as anglers. Another bait that's available, yet not used to its potential, is fresh bread. While the budget $1 loaf is great for the berley bucket it is the top shelf white bread that makes the best bait. The soft white centre of each slice moulds and holds together on the hook to form a doughy ball that will resist most pickers until the pigs find it. Incorporated with a trickle of mashed bread berley, and the odd crust to distract the toads, bread as bait, can be very effective and cheap. Naturally occurring baits in the intertidal zone include sea cabbage and cunjevoi which can be harvested during the low tide period in areas that are not protected zones. Cabbage is an important bait where you get the ravenous pickers like toads, sweep and butterfish - often attracted by the hint of berley. Baits like cunje, prawns or other soft morsels will be stripped from the hook soon after it splashes down, whereas, cabbage will sink beyond the hordes of pickers and will appeal to both blackfish and the pigs. Cunje, on the other hand, appeals to everything that lives on the coast. When cutting cunje it is important to try to remove the bivalve flesh in one piece and spread your harvesting efforts over a wide area so impact on any one colony is limited. Cutting vertically through the top of the case and around the diameter will allow you to extract the cunje intact. The valves are the toughest part of the flesh so by threading the soft belly of the cunje on the hook first the valve end can be used to secure the bait with the point and bend of the hook. Depending on where you visit the coast line will determine your fishing plan of attack. Pigs can be like any other fish in that they can be shut down in one area but going off in another, even a change to the other side of a headland can work. On the Mid Coast of NSW it pays to be as mobile as possible and if one area isn’t working you move to the next spot, next headland or next gutter of rocks. With a waterproof backpack, a couple of small containers of hooks and sinkers, a spool of leader material and shoulder bag for fish, berley and bait you can fish an extensive stretch of coast with little effort. Packing light and having everything in your pockets or pack, there is little time wasted picking up and putting down gear at each spot. Rock blackfish of around a 1.5 to 2.5 kg are best for eating. Evolution of fish species, to adapt and thrive in different environments, means their feeding, protection and ultimate survival relies on physiological adaptions made over tens of thousands of years. The shear bulk and muscular strength of pigs is a design to allow them easy access to growth on the rocks and resist the tidal and wave surges that could easily leave them stranded in shallow water. The powerful, white knuckle runs the fish make on the end of our lines is the sort of strength they need to survive in the turbulent intertidal wash zones. Another adaption that benefits the eastern rock blackfish, in their violent and rocky world, is their own crumple zone or impact panels. The fish’s overlapping scales come away very easily and act as protection from impacting the rocks. Rather than hitting rocks, causing abrasion damage to the fish, the scales simply slip away reducing the friction of the impact. I can only assume the scales are quick to recover and patch the affected area. Eastern rock blackfish are often referred to as drummer or black drummer, yet they are not drummer at all. They are, however, closely related to luderick and share the same grazing type teeth. Their teeth have three rounded knobs on each tooth and when their teeth come together it creates a pinch point that helps them feed on the shortest of weed and algae growth. The nature of their feeding habits means their teeth wear down or get broken as they grind and bite down on rocky outcrops. To overcome broken or worn teeth the pigs have another layer of teeth constantly growing, so when replacement of teeth is required there is always one or two new teeth mere millimetres away. The rock blackfish can vary their colour to suit their environment though the dark charcoal to black colourisation is what we generally associate with the pigs. During the day, when they aren’t feeding they can often be found hiding, in a school, under rock ledges or underwater caves and is one of the reasons for their dark colour. When conditions present clear water and a lack of wash the fish will tend to hold to cover and it not until the dimming afternoon light that will have them moving around more freely. It is often when they can be very aggressive on baits too. Night sessions on pigs are not uncommon and they are often a by-catch of anglers potholing around rocky ledges after dark. Night sessions are an option when the water is clear and the cover from the wash is limited. 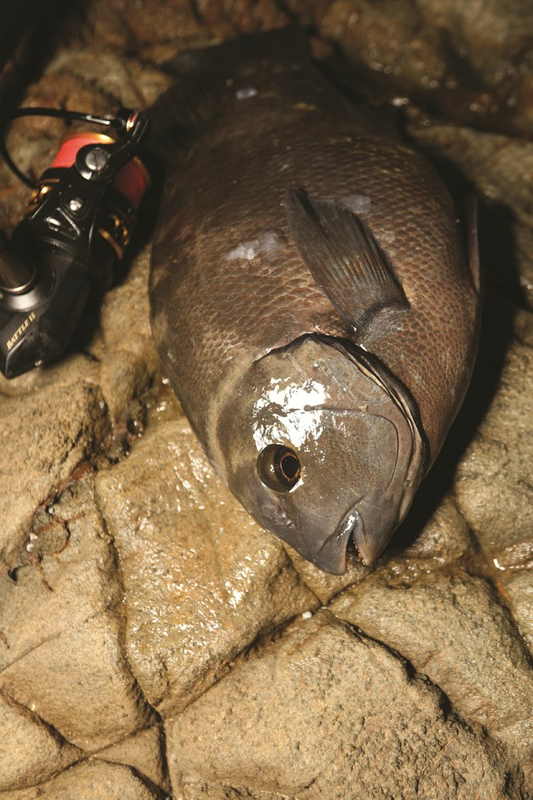 Special care is required if you are fishing the rocks after dark, even if the seas are flat and featureless. Tackle choices depend on the location you are fishing, the slot size fish you are targeting, and the potential by-catch you may encounter. There is no doubt that a long rod of around 2.7m or more is good for steering fish around bommies, holding them out from under your feet, and elevating the line off the waves and rocks as your bait sinks. The rod needs a fast taper to provide a sensitive tip to detect bites but sufficient mid strength to lift fish out of the water without high sticking it. In the past the old Butterworth blanks were the key to a good rock rod and the MT6-144 (Multi Taper, 6 wraps, 144 inches) was one of the best. These days we benefit from advanced material, components and a crazy number of choices of rods, so it is a matter of getting into your local tackle outlet that stocks brands like Penn, Abu Garcia, Wilson, Daiwa and Shimano. Like most rod and reel combos it is difficult to determine the feel of the outfit unless it’s in your hands, so a visit to the tackle shop is, in my mind, essential to correctly balance the tackle to your hand. It's common to see thread lines reels used for bait fishing from the rocks and, again, it is the development and quality of materials that has propelled their use. You do not need an overly sophisticated or expensive reel that can cast a mile out of sight nor a large capacity spool because all your pig fishing is within a 40-metre radius in front of you. The relatively low cost of a quality reel, that has a good drag and a decent handle knob, allows you to have a dedicated pig outfit without compromise. Perhaps the best value for money is the range of Penn Battles or the Clash series. The reels are built well and in the 5000 or 6000 size are ideal for this type of fishing and matched to a rod that feels good in your hands; you’re set. It's common to see thread lines reels used for bait fishing from the rocks. The main line is one component of the tackle that needs to be considered depending on the type of terrain you are fishing, the potential for big fish and other species like groper. While some anglers don’t like braid, due to the non-stretch, I love it, simply because of the rugged, broken and shallow reef that makes up my local patch is unforgiving. A half to one rod length of 36 lb Schneider mono is my basic leader rig that is tied to the 30 lb braid mainline with either an FG or improved Albright. Of course, the prevailing conditions will drive decisions on leader strength and size but I know that, on any given day, I’m likely to encounter a blue groper anywhere up to 12 kg, so I start with the greenish mono and gauge the fishing after a while of feeding the pickers. Leader strength can range from 16 lb to 40 lb with a comfortable mid-range being a good starting point, say, half a rod length of 20 to 25 lb. With clear and still water, the likes of which westerly winds can deliver, the leader strength will need to be reduced to accommodate the lack of cover in the form of wash. Reducing leader strength to as low as 16lb and lengthening the leader to a rod length may encourage the fish to take your bait but it will have to be fished deeper and in proximity to crevices and rock shelves from where the fish can dart out for the bait. If I find the conditions are too flat and clear, I’ll swap to chasing groper with crabs – no point wasting a day. Terminal tackle is basic and variable due to the sea conditions and surge of the waves. The idea is to provide enough weight to get the bait below the surface but not enough that it anchors itself to the weed and growth on the rocks below. An assortment of size 0 – 1 ball sinkers is sufficient along with hooks from No 1 – 2/0 size with a turn-in or out-eye to make a Snell connection on the shank as easy as possible. Owner SSW, Gamakatsu bait keepers or Mustad 542 bronze hooks are perfect and a Snell knot to the shank eliminates knot travel around the eye of the hook. It also prevents the sinker bedding over an eye-tied knot and potentially weakening the connection. The idea behind tying to the shank is that when you strike the hook is always straight on your line and provides the best penetration angle to hook the fish. A small sharping stone in your pocket will assist in keeping the bronze Mustad hooks sharp and in my mind is a must have part of your kit. It is important to stay in touch with your bait while fishing from the rocks. Wind and the actions of the waves can produce a belly in your line and disguise the, often, delicate bite of the rock blackfish, or other species for that matter. Supporting the line with your index finger, off the spool, you will soon be able to distinguish the bite of bream, kelpies and pigs and be better equipped to know when to strike. When fishing in strong wind, blowing onshore, lowering your rod tip so the line contacts the water will help to control the belly in your mainline and transmit the bites in these trying conditions. Remember too, no matter how much wash there is, a metre below the surface is generally clear water so the fish can see everything and your bait presentation can be critical to success. Typically, pigs are around most of the year but are at their best during the cooler months. 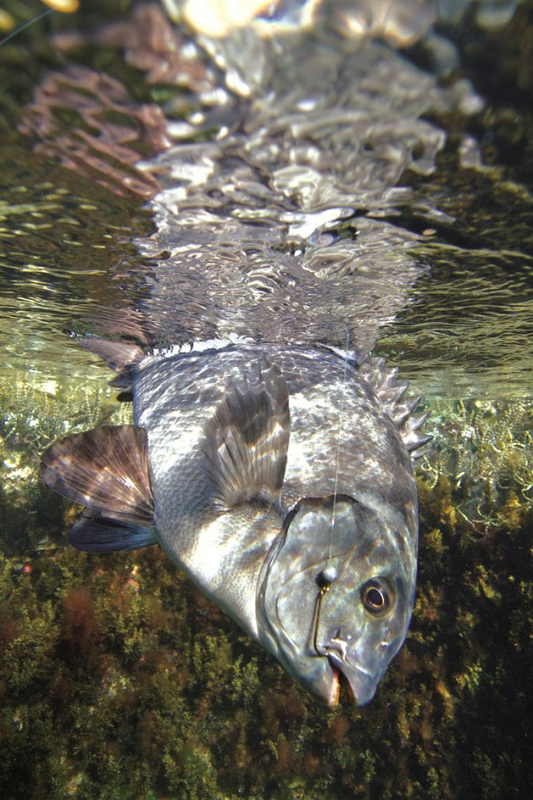 The winter months and drop in water temperatures also promotes the spawning cycle of the pigs in and around the coastal fringes of North-east Victoria and much of the NSW coast. There is a transitional and geographical change in timing of exact spawning periods but anywhere from July to the end of September, the likelihood is, the fish will be full of roe and milt along the east coast. The winter months can be less than inviting to get out fishing, especially after a big southerly blow that serves to fire up the pigs to gorge themselves on all the detached vegetation. The wonderful thing is that you don’t have to go out into the pre-dawn cold to enjoy great rock fishing. Rock blackfish are more reliant on the rising tide that floods the intertidal zone and provides access to the algae and weed growth that has softened or died while exposed. For the most part, fishing a rising tide to its peak and part of the run out is sufficient to tangle with the pigs. To get the most from your efforts it is a good idea to fish the full and new moon periods where the transition of tidal levels is at its greatest. This gives the fish more water, to access areas that have been off limits due to the shallower variance in water levels. In spite of media reports and thoughts, rock fishing is as safe as driving a motor vehicle provided you mitigate the risk with simple precautions that we have heard relentlessly in the past. Bear in mind if you can’t swim, don’t fish from the rocks it is that simple. Regardless of the risks you may take, while fishing from the rocks, accidents happen. Trips and falls may see you end up in the water and if you hit your head on the way in and become unconscious, no manual inflating PFD will save you. An auto-inflating PFD or foam life vest are the best options. Remember too, no matter how strong a swimmer you are, your buoyance is reduced in the bubbling wash and injury may compromise your perceived abilities. It is our job to stay safe while fishing and no-one else’s. Rock blackfish of around a 1.5 to 2.5 kg are my preferred eating size. Larger fish tend to get a little tougher, so they get released as quickly as possible. The fish are slow growing, like bream, but with no commercial pressures the fishery is sustainable while ever we make reasonable choices to only take what we need. The current NSW 10 fish bag limit is, in my mind, excessive and would be better reduced to 5 fish to help promote the culture of sustainability. The fish should be bled as they are caught, then filleted and skinned to make the most of the lovely, firm, white flesh. Cooked with the skin on can introduce a bitterness to the fillets, which some people don’t mind but skinless and cooked in a pan with butter and a crack of salt/pepper they are top shelf.